The South of France is famous for many things – sunshine and blue skies, the deep blue Mediterranean Sea and the mouth-watering regional cuisine. But did you know that the French Midi has a rich cultural heritage, with a quarter of France’s UNESCO World Heritage Sites located here? And the best bit is that you can go and explore all 11 of them. Check out these UNESCO World Heritage sites in France we love. What’s so special about a UNESCO site? UNESCO is the United National agency concerned with educational, scientific and cultural matters, while their World Heritage sites are places that have been listed as being of special cultural or physical importance. Any building, monument or region can achieve UNESCO status, thus ensuring its protection, promotion, and attraction as a tourist venue. The South of France boasts 11 such sites, a testament to the huge cultural variety to be found in the region. Of course, the fact that the Romans passed this way en route to conquering Spain and a large part of what was then Gaul has a lot to do with it too! So what can I see or do at a UNESCO site? What is there to see and do at a UNESCO site? Well, it all depends on which site you want to visit. If you’re going to the Cité de Carcassonne, be prepared to spend a whole day exploring this fascinating medieval citadel. Reconstructed in the 19th century and saved from oblivion, Carcassonne is everyone’s idea of the perfect picture postcard fortress. There are battlements, ramparts, a drawbridge, a moat and even the jousting lists. Should this prove to be too much history for you, why not seek retail refuge in the many little artisan shops and cafés hidden up the petites ruelles of the town. The kids, meanwhile, will love the haunted house, perhaps followed by a visit to one of the curious little shops that sell toy weapons and armory. 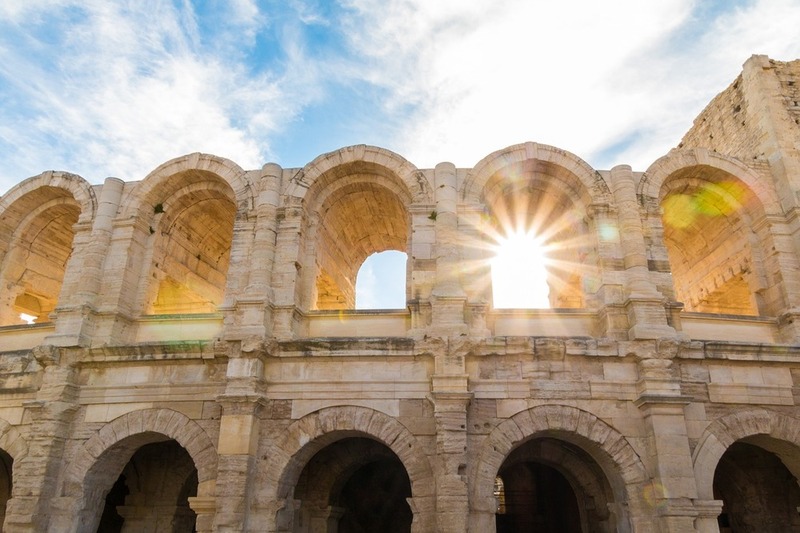 On the other hand, you could pay a visit to the Pont du Gard, an ancient Roman aqueduct crossing the Gardon River and an iconic feat of Roman architecture. Watch the kayaks float past between those famous arches or, better still, have a go at kayaking yourself. Great fun for all the family, there are plenty of spots on the River Gard to hire kayaks and canoes for the afternoon. The Pont du Gard is also an excellent vantage point for people watching. Why not while away a few hours while you observe visitors from all over the world enjoy this famous spot. Often, you don’t even need to go in search of a famous site – sometimes it’s just there. The Canal du Midi, for instance, wends its peaceful way from the Etang de Thau near the western Camargue all the way to the Garonne near Bordeaux. Wherever you travel in this beautiful area of southern France, you’re sure to catch a glimpse of its sheltering maple-like plane trees or the odd pleasure cruiser carrying eager sightseers. Another enchanting UNESCO site is the Causses and Cévennes, a Mediterranean agro-pastoral cultural mountainous landscape that’s over 3,000 years old! The entire region of the Cévennes has been barely touched by man and, apart from excellent hiking on well-marked trails, you’ll find countless little museums where you can see how life used to be. The local inhabitants survived by keeping goats and cultivating chestnuts for making bread. Lucky for you, because these days you can enjoy fresh goats’ cheese from local organic farms and a variety of chestnut products including delicious French delicacies marrons glacés and chestnut purée.